I really enjoy playing with the classic Israeli Salad concept and making my own unique versions. 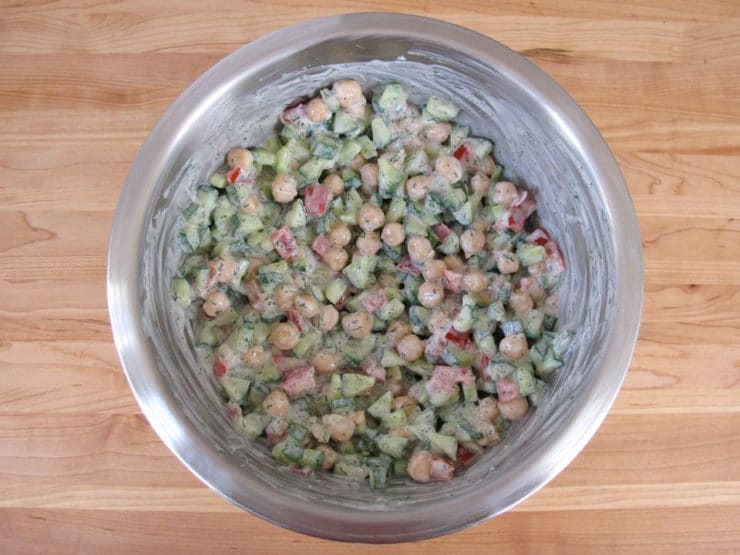 This Creamy Israeli Salad with Dill is full of fiber and “friendly flora” (probiotics). Greek yogurt is one of my favorite foods; it’s strained, so even the nonfat versions taste divinely rich. It also happens to be higher in protein than regular yogurt. The creaminess of the yogurt, combined with fresh dill, really compliments the flavor of the Persian cucumbers. I also added chickpeas for protein, and some lowfat sour cream for extra oomph (you can use all Greek yogurt if you prefer). To learn how to make Greek yogurt at home, click here. 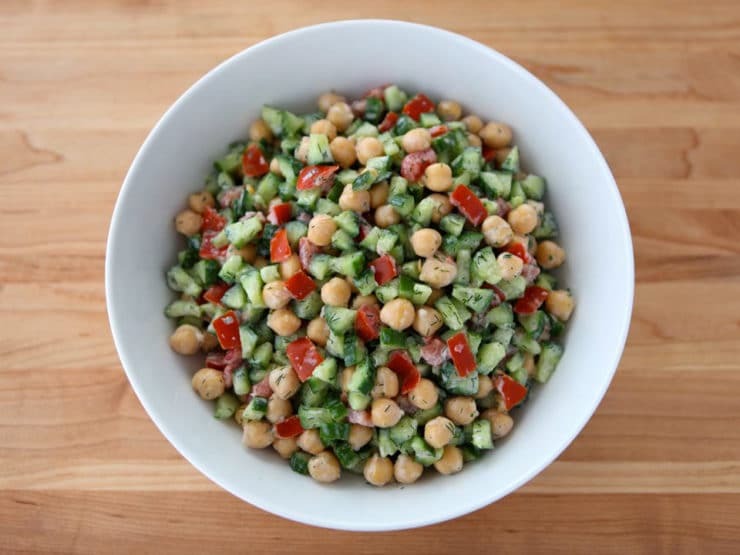 Israeli salad is a really versatile dish. Use your imagination to create some delicious variations of your own! 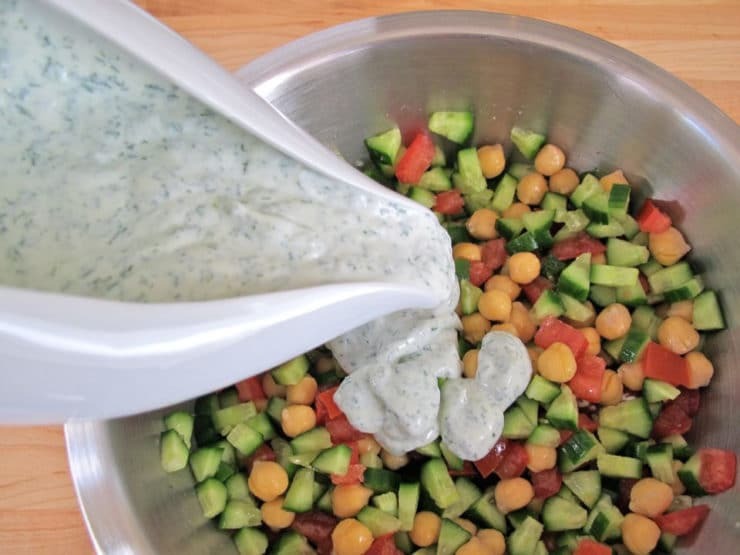 A creamy twist on Israeli Salad with Persian cucumbers, tomatoes, chickpeas, Greek yogurt, lowfat sour cream, fresh dill, and lemon juice. 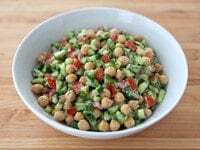 Combine cucumbers, tomatoes, and chickpeas in a salad bowl and gently toss till well combined. 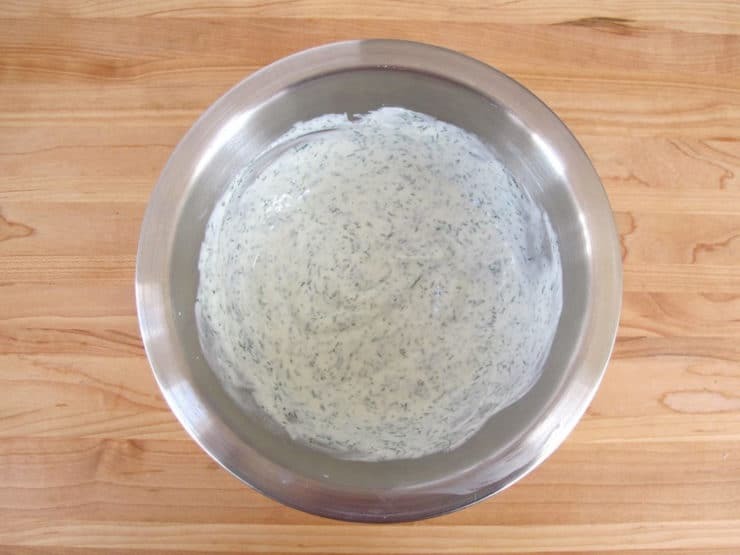 In a smaller bowl, whisk together Greek yogurt, sour cream, dill, lemon juice and salt. Pour the creamy dressing over salad. 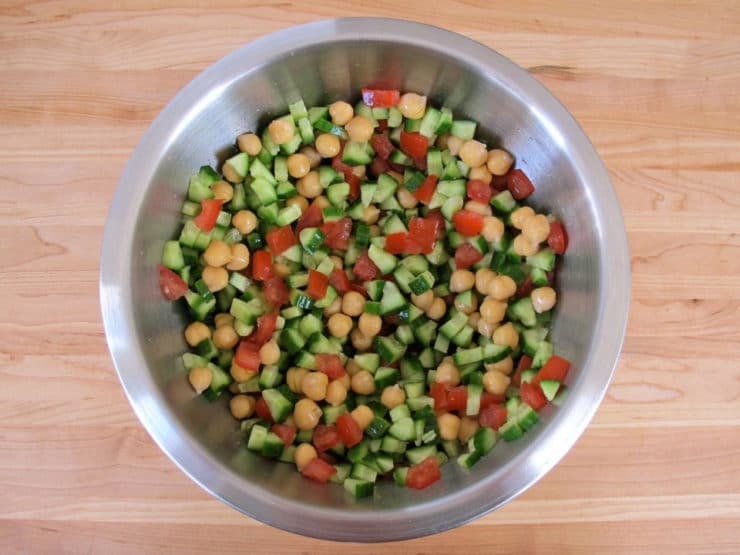 Toss the salad gently till all ingredients are well combined. Add additional lemon juice and salt to taste, if desired. Chill salad before serving. Juices will gather at the bottom of the bowl as time passes. To get rid of excess yogurt juices, you can strain the salad in a colander before serving. I like sopping up the juices with whole grain bread or challah. Modification: If you're not a fan of dill, you can substitute chopped fresh mint leaves. Will do. Thank you Tori! This looks amazing! Can it be prepared a day in advance? Hi Jennifer– you can make the salad a day ahead and chill it, but wait until the day you serve it to toss it with the dressing. We’re keeping the dill for sure! 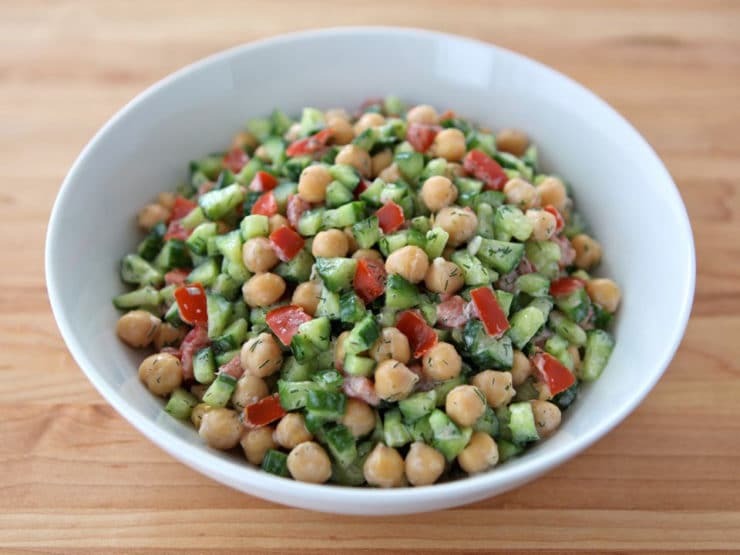 It’s beautiful with yogurt and chickpeas. drip process and get some interesting spreads or dips. but it is neater, and takes up less space in my small fridge. This sounds so good, I love greek yogurt. post more like this for us veggie Jews!